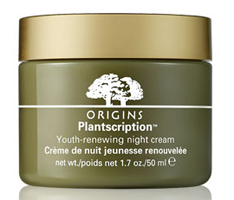 Right now you can score FREE Plantscription Youth-Renewing Night Cream & Face Oil Samples at your nearest Origin Store! All you have to do is click "Get Offer" and redeem it. No purcase necessary and the Mini Facial is not required to get the samples. This offer is valid in-store only! Take home a one-week supply of NEW Plantscription™ Youth-renewing night cream (5ml), plus a one-time use of NEW Plantscription™ Youth-renewing face oil.